Just because other people sell out to some corporation and are willing to hate their life for the off-chance they might retire one day doesn't mean we have to live like that. You can put off what you love until you're too old to do it, or you can live for the present. Of course you'll need to be responsible enough to consider the future too, which is why this post is about the lucrative careers in the music business. Because, let's face it... becoming a huge rock star or pop star is slim pickings. There's not a lot of room at the top and it's not even based on skill any more. It's about marketability. Otherwise, you're a starving artist as many of us know. And while that may be good enough, many of us have other aspirations we want to chase throughout life too, but you can have your cake and eat it too by working in the music industry. There is no lack of musicians all clawing at a shot at the big time, and somebody has to be there to support the infrastructure around it. Work in that sector of the industry and you'll never worry about job longevity, seasonality, or any lack of opportunity. Why Are Music Business Careers Attractive? The reality is that no matter how bad things become economically in a country, people always desire entertainment. Sometimes, they want it even more once money is tight, because they need an escape. People will always consume music, whether that's through streaming and downloading albums or going out to a venue to see a concert. They'll watch documentaries about their favorite artists or tours. Young people will always buy merchandise in order to display their personalities to others. Music is an integral part of our lives as much as groceries, automobiles, electricity, and Hollywood. As a matter of fact, the music industry is tightly knit with Hollywood which isn't going anywhere either. It's double reinforced. And we all know how much money flows through both of these industries. And the thing is, it's all hands-on. None of this will become automated by robots. Someone has to organize the tours with all of the venue owners. Someone has to set up the stage lights, effects, and instruments. Someone has to run the marketing campaigns online and offline. Someone has to run the recording studio, mix the record, master it, ship it off to the presses, get distribution for it in the stores, etc. Let's talk about a few of the careers in short form to give you a frame of reference, and then I'll add even more in list form that you can research if you'd like. The "A&R rep" position is somewhat like that of a record producer, but instead of overseeing the aspects of an album, you do this for every other aspect of the artist's career. This can mean that you scouted them out at a local bar, groomed their appearance, acted as a liaison with a label to get them signed, matched them with a studio, found songwriters to help polish their material, and so forth. This is a pretty big deal position that requires you to know the ins and outs of not only music but business as well, while being quite the socialite. A booking agent manages the tours for all of the artists on the label or that roster within the label. He or she will use their contacts built up through years in the business to schedule a linear path through out a country from venue to venue in a way that is economically feasible and is capable of being achieved, time-wise. They'll negotiate payments, the terms and provisions required by the venue to provide comfort and security, and more. They are the tour managers. A concert promoter is a soldier on the ground. He or she is assigned the task of making contact with venues and creating the connection that opens it up as a possible location for a tour. They will also find local talent to serve as openers. They market events online and offline, knowing where to advertise and which locations to post flyers. They may work for a label or be a local specialist that is contracted when a tour passes through their city. A music publisher is very much like a producer in terms of being able to spot hits, fix weak parts of songs, and having that bird's eye view that is attuned to what the fans want. But the difference is that they don't work with any one artist or group. They scout songs like an A&R rep might scout talent. They'll scour demos from songwriters and recognize hits that they can then pitch to the artists on their label. If all goes well, the next hit is polished and birthed into the attention of the public and everyone wins. They also pitch existing music from their roster to TV and film, whether that be 15 second clips or soundtrack slots. Successful pitches to non-industry companies with music needs goes to this position. A licensing consultant will coordinate with the entertainment attorney and financial advisor to make sure everything is squared away before a movie can use one of the songs in their catalog in a trailer or ending credits, for example. The same goes for commercials, video games, and any other media that desires using a popular song to help market their own material. This position is a lawyer that focus on the entertainment industry. You can go sub-niche and be a music attorney specifically as well. They draw up and sew up every possible hole in contracts, are present for negotiations, provide legal counsel, and more. We all know what lawyers and attorneys do. It's all of that but for the music industry. A studio engineer runs the studio that is tapped to record an artist or band's new album. They have a masterful command of the recording gear and can even double as a mixing or mastering engineer. Many times they can even take on the role of a producer as well. This can be a very lucrative position as you begin to rack up the hits and the royalties begin to pour in. But it also requires the most technical know-how and skill, and a lot of money to build and stock up a studio. Often they'll be commissioned to record live shows or set up live mixes on tour. Music touches every aspect of our lives and there's nearly a job for every tangentially related aspect out there. And if you can't find a job in the sub-niche you want, you can work any other one since they all brush shoulders. This is the fast path to establishing a high-paying, long-term career: networking. It's all about who you know and what they think about you. Jumping in and learning the ropes is a great idea for anyone who intends to start their own label or business in the industry too. It's nearly impossible to say with so many various positions and labels, but we can look at overarching trends and extrapolate about stability. Above are the revenues (not profits) of the music industry from 2005-2015 as reported by International Federation of the Phonographic Industry. IFPI recently reported that the industry saw a 5% increase in revenues in 2016, which I speculate is the industry at large finally accepting and becoming situated within our growing digital landscape. As for you, you'll likely start with a smaller record label with less funding to give you an insane salary, but you'll work you way up the ladder with them or leap to a bigger label when you spot an opening. It also depends on the position as well. You can go from average earnings with a smaller label and a smaller role like a concert promoter, or you can earn a ridiculous salary as a producer or music attorney for the top artist on a huge label. Either way, it's not just your salary that counts. You'll travel on the label's business expense accounts, eat good food, be given stipends, rent nice cars and hotels, and much more. There's a lot more to it, like regular life expenses that get passed on as an expense, that you have to consider. But in terms of any specific amount, you can investigate the statistics at the U.S. Bureau of Labor Statistics to get a better idea for your specific path. Here's the data for Recording Engineers, for example. What Should My Credentials Look Like to Get Started? Now, some of these jobs don't demand any specific credentials, but all of them will require some amount of experience. Others will demand some form of stamp of approval from an accredited oversight committee (meaning you'll need at least a bachelor's degree). Some only require that you're actually good at the job. The fastest way to gain experience is through a college or university, mostly through earning a music business degree, because they'll have hands-on studios, recitals, radio stations, and agreements with businesses to place interns. That's what "experience" means in the business world. It means you've actually done the job at a place that makes money doing it, even if you were an unpaid intern. It's also the only way to get accredited when a workplace demands a certificate or degree. Below is a handful of schools to start your exploration and learn about the courses and application requirements that are typical of the programs for the industry. As seen above, the possible ways to earn money in the music industry are nearly endless. That's great for those of us who either love the industry but aren't very musical, or perhaps are but don't want to go the starving artist route. Sometimes sliding in from another direction can help get you a chance to have your music heard. Lady Gaga was a songwriter writing for Britney Spears, Fergie, The Pussycat Dolls, and many more before breaking out on her own. There are a lot of paths to the top that aren't the hard one, and all of these are among them. 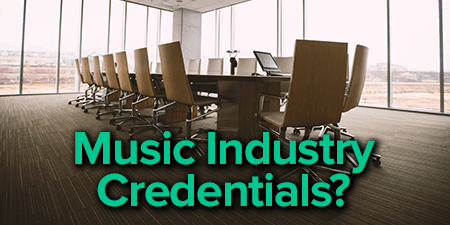 But you will need the right credentials, so check out some of those best music business schools above so you can score a solid music business job and start living the life!